Installing and maintaining solar thermal closed-loop systems requires hands-on troubleshooting ability across both drainback and pressurized systems. Likewise, engineers and designers need to understand the technologies utilized by these systems. 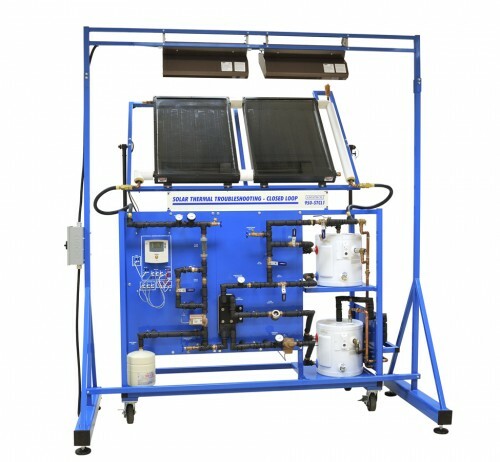 Amatrol’s Solar Thermal Troubleshooting – Closed-Loop Learning System (950-STCL1) allows learners to develop the specialized skills and knowledge needed for working with the two common types of thermal closed-loop systems: drainback and pressurized. Solar Thermal Troubleshooting teaches learners about connecting, operating, programming, and troubleshooting both drainback and pressurized systems. The curriculum is presented in a highly-interactive, multimedia format that allows learners to use the learning style best for them: reading, listening, or visual. Solar Thermal Troubleshooting supports the NABCEP (North American Board of Certified Energy Practitioners) test for Certified Solar Thermal System Installer. Solar Thermal Troubleshooting includes all components needed to develop hands-on, job-ready skills. The learning system contains a mobile workstation, multiple component circuit panels, two solar collectors, and fault insertion. An optional sun simulator is available to facilitate classes indoors when outdoor conditions do not support solar heating. At the heart of a technician’s skill set is the ability to troubleshoot a system. 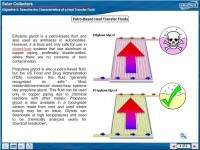 Solar Thermal Troubleshooting is equipped with a wide array of both electrical and fluid faults that allow instructors to replicate realistic system and component failures. Learners will practice independently solving the many common types of situations they will encounter on the job. Developing installation and troubleshooting skills for solar thermal systems requires all the components commonly found in these systems. Elements such as vacation bypass, check valves, relief valves, flow meters, and tempering valves are essential to create realistic systems and troubleshooting situations. Amatrol also includes a digital differential controller that features many programming capabilities which allows learners to practice programming the more sophisticated thermal systems that they are likely to encounter. Solar technicians will encounter both drainback and pressurized closed-loop solar thermal systems. Across any given region that experiences freezing conditions, both of these systems are used extensively. Amatrol includes the components needed to configure either system, including both an expansion tank and drainback tank. Learners will switch between the two systems with valving. Amatrol also offers a Solar Thermal Sun Simulator (95-STS1) for use indoors with the Solar Thermal Troubleshooting. The Solar Thermal Closed-Loop Learning System’s two thermal collectors work either outside with direct sunlight or inside with the sun simulator. Amatrol’s unmatched multimedia utilizes text, audio, and stunning 3D animations that engage learners in both theoretical knowledge and hands-on skills. This thorough, exceptionally detailed curriculum is built to begin with the basics and steadily advance to more complex concepts and skills. Through partnerships with key industry leaders and leading-edge educators, Amatrol developed the right balance of knowledge and applied skills needed to train learners to work in their chosen field.